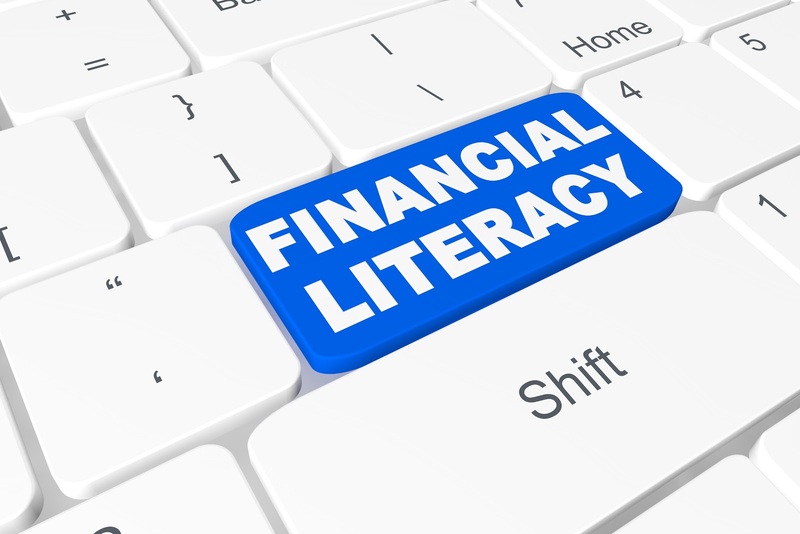 April is Financial Literacy Month. Financial literacy is one of the literacies our students need to succeed. Financial and economic literacy are about understanding the importance of making appropriate economic choices on a personal level, as well as understanding the connection that personal, business, and governmental decisions have on individuals, society, and the economy. How can you ensure students master the financial literacy skill-set? The PricewaterhouseCoopers (PwC) Charitable Foundation offers a online comprehensive financial literacy program designed for students in grades 3-12. The content of the program is aligned with the Council for Economic Educators standards. Students engage with financial literacy concepts through innovative self-paced modules featuring custom videos, animations, and interactive activities. The curriculum is called Earn Your Future Digital Lab. Here is a screenshot of the modules for the Intermediate Level. 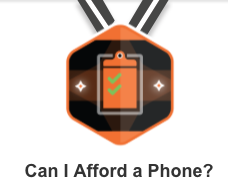 I logged in as a student and picked intermediate module three, "Can I Afford a Phone?" The module can be completed all in one sitting, or students can go back to a section later to finish it. I completed the module using a laptop computer, but then went back and tested it with an iPad. Everything seemed to function perfectly on the tablet. Of course, since the site is Web-based, it should work fine with Chromebook and the Surface, too. 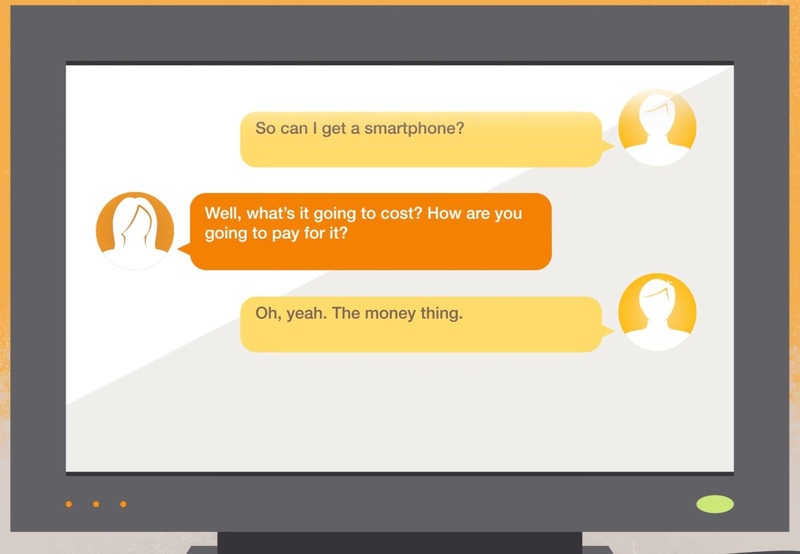 The module started off with a video of a clever texting session between a teenager and their parent. During the texting session, the parent gives the responsibility to their teenager to do the research for the best phone and also to figure out the costs of affording a new phone. The module continues with sound advice on how the student might proceed and offers a commonsense plan on how the teenager might approach the problem. This is followed up with a quiz about spending and budgets to gauge what the student already knows. After answering each question, the student is provided with additional information if they answer incorrectly but also with clarifying information if they answer correctly. The next component of the module is very engaging. Students pick an avatar to "become" the teenager who wants the cell phone. This is followed up with a checklist of tasks to research the phone purchase (with a pop-up for each item) and time is left for reflection by the student and a short two-question quiz. The module then moves into teaching the budgeting process so students can apply the process to the teenager's research. The students can utilize the included calculator tool to determine if the teenager can successfully create a budget that allows him to purchase the new smartphone. There is a computation piece included with some simple math problems and a review of income vs. fixed expenses vs. variable expenses. 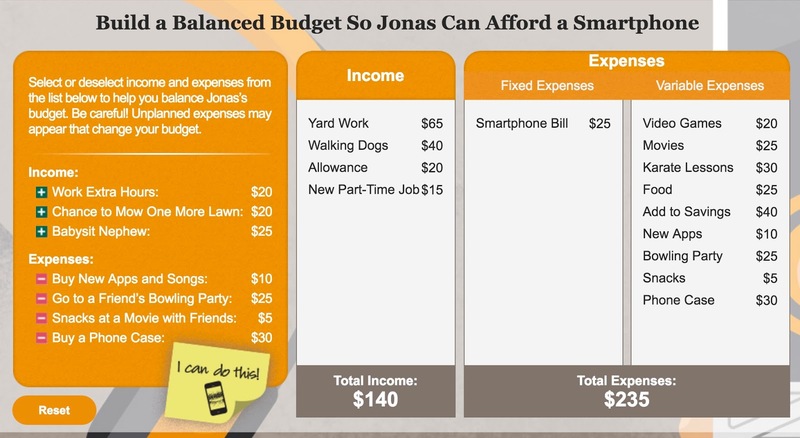 There is a fun final activity that allows the students to build a balanced budget for the teenager. The interesting part is, as the student eliminates unnecessary expenses, there are pop-ups with unexpected expenses or income, like a library fine or income from babysitting. 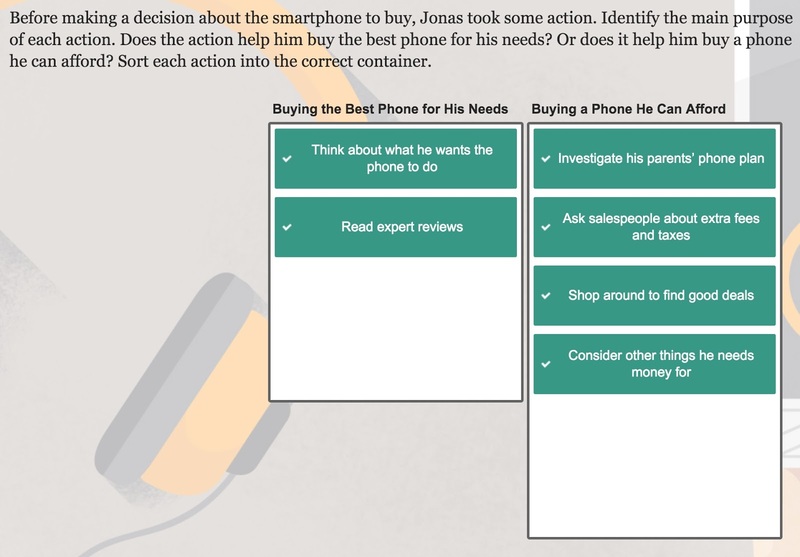 This component truly simulates what this is like in real-life and teaches the students the difference between wanting something and being able to afford it. There is a wrap-up of the module with a nice overview of the processes taught and including some extension tips for dealing with budgeting throughout their lives for purchasing a home, saving for retirement, etc. The final component of the module is the post-test, which includes several types of summative assessments. The post test should only take about ten minutes, and, at the completion, the student earns a badge to show the module is completed. The Advanced modules, intended for high school students, also include real-life videos starring teenagers. 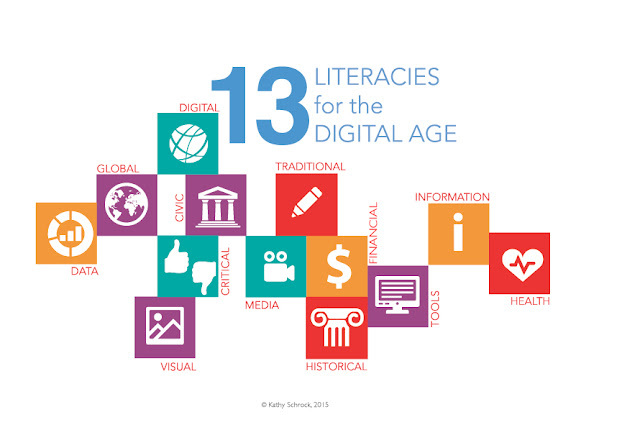 This makes the modules even more engaging for the students. After the student has completed the modules, the site also provides additional resources to build-upon the skills practiced in the program including planning for college, home buying, risk management and insurance, planning and money management, and more. To give students access to the site, the teacher or home school parent creates a teacher account on the site. Once logged-in, the teacher creates a default password for all of the student accounts. When a default password is set, students will be asked to create a personal password on their first login. Student names can be entered manually or uploaded via a CSV file. The teacher then creates a class and picks students to add to the class. 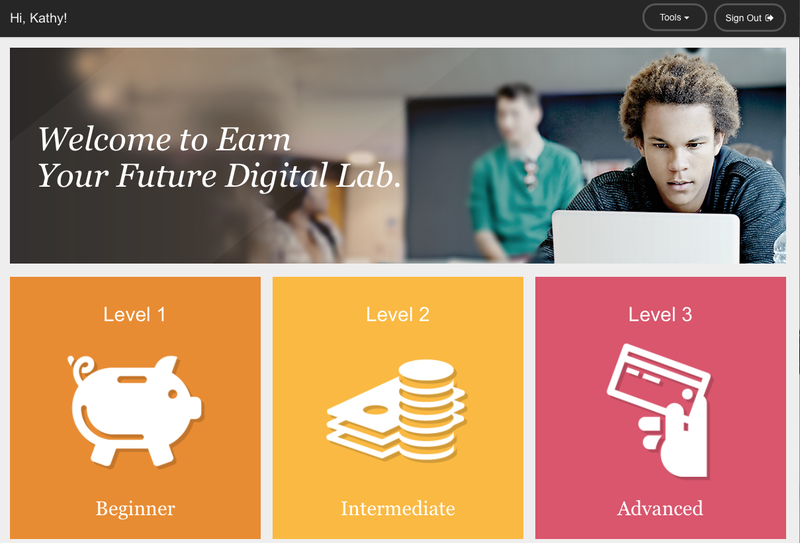 Teachers then provides students with the the URL to the PwC Charitable Foundation Earn Your Future Digital Lab site, their username and the default password. Students can log-in to the site and work on the modules. 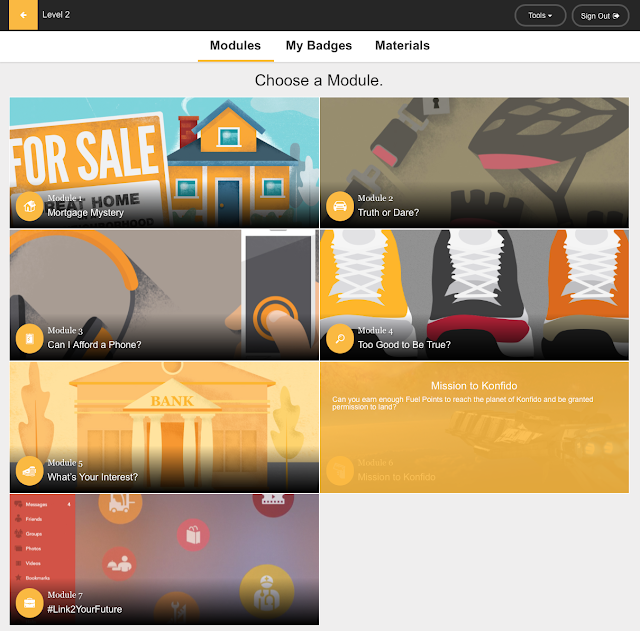 One suggestion, to make sure students stay on task and complete the modules they pick to complete is to have the student print out their "badges" page which will show the completed modules. The PwC Charitable Foundation Earn Your Future program is brand new and additional features are planned for the near future. These include handbooks and module planning tools for the teacher and the ability to provide feedback to students via embedded assessment tools. If you want to engage your students in learning more about personal finances, whether in April or throughout the year, the PwC Charitable Foundation curriculum, Earn Your Future, is a wonderful way to engage students and help them practice and learn useful, life-long skills! This is a sponsored post on behalf of We Are Teachers and the PwC Charitable Foundation.